A book on Thang Trần Phềnh (1895 – 1973) was recently launched in Hà Nội and HCM City. The book is compiled by author Ngô Kim Khôi and is a rare chance to learn about one of Việt Nam’s least-documented artists. Khôi works as a fashion designer in France. 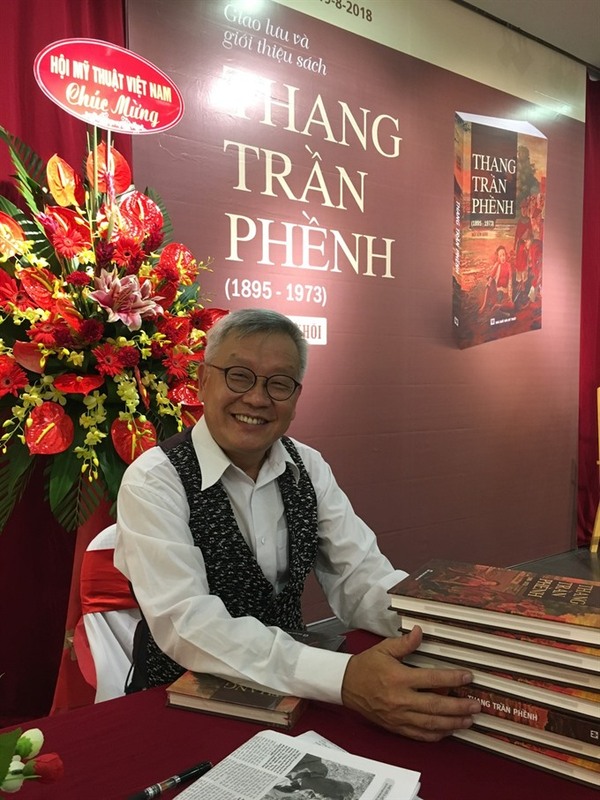 He has written several books on Vietnamese artists, including Lê Huy Miến and Nam Sơn, who are regarded as the first artists of Việt Nam’s modern fine arts. Nguyễn Thúy Bình interviews Khôi about the book. I began to write the book ten years ago. I collected documents about artist Phềnh during my time researching the Indochina Fine Arts College. In research, there are many things related to each other because they are from the same historical period. Thus, the researcher plays a role as an archeologist discovering something new. One small thing could be an important discovery. During my research about the college, I found some documents related to artist Thang Trần Phềnh and I decided to write a book on him. I have researched the fine arts of Việt Nam for nearly 30 years, and the Indochina College of Fine Arts in particular. During this time I found many artists who contributed to the college, including popular and unpopular names. Artist Phềnh was one of the unknown artists. When I read about the history of Vietnamese fine arts I found that not many knew much about Phềnh and his work. Only three of his pieces were popular and displayed at the Việt Nam Fine Arts Museum in Hà Nội. Phềnh, alongside Lê Văn Miến and Nam Sơn are usually mentioned as artists contributing to lightening Việt Nam’s fine arts. Like many other people who are keen on fine arts, I wanted to know more about his life and his work. One of the most interesting things is that I found Phềnh’s paintings thanks to letters from Victor Tardieu and Blanchard de la Brosse, from France. Tardieu and Vietnamese artist Nam Sơn were co-founders of the Indochina Fine Arts College, while de la Brosse was a French Governor in Cochinchina (South Việt Nam). I had many questions as there were very few documents about Phềnh, despite his work before the establishment of the Indochina Fine Arts College in Việt Nam. I could not find the answers. Are you satisfied with the book? The editorial board and I proofread the book many times but there are mistakes. Sometimes, there are incorrect words or spellings. Right after printing we found that the artist’s date of death in the book and on the cover are not the same. There is a difference of one year between them. The mistake happened because in the book we corrected the date thanks to documents from the artist’s family, but we forget to correct the cover. Oh my God! There is also a mistake in the caption on pages 32-33. Nevertheless, when the book was launched we were pleased to see some collectors come forward and share more paintings by Phềnh. Are there any details in the book you found difficult to verify? To verify details is very difficult. I couldn’t see the paintings with my own eyes except for the three at the Việt Nam Museum of Fine Arts. Some paintings I know by name only. I think that an artist can paint hundreds or thousands of paintings during his career. And he surely wants his works to be popular. I hope this book will encourage collectors to share more paintings by Phềnh. I’m lucky to have had three sources which were reliable. The first one was the Tardieur family. I met Tardieur’s son who showed me some letters sent by his father. He also allowed me to read letters between Tardieur and his students at the Indochina Fine Arts College and documents and images related to the founding of the college. This was a huge help for my research. The second source was artist Nam Sơn’s family. Finally, I live in France so I can access archives such as Centre des Archives d’Outre-Mer at Aix en Provence; Institut National d’Histoire de l’Art and National Library of France. What significance will the book have on Việt Nam’s fine arts? Not only Phềnh, but there are many unknown Vietnamese artists, such as Vũ Đăng Bốn, Phạm Hữu Khánh, Hồ Văn Lái, etc. This is a problem for Vietnamese fine arts. Other artists with popular names such as Lê Phổ, Nguyễn Phan Chánh, Lê Văn Đệ, Vũ Cao Đàm and Nguyễn Gia Trí made contributions to Vietnamese fine arts. I hope the book on Phềnh will inspire more researchers to study them. Do you intend to translate the book into French or English?